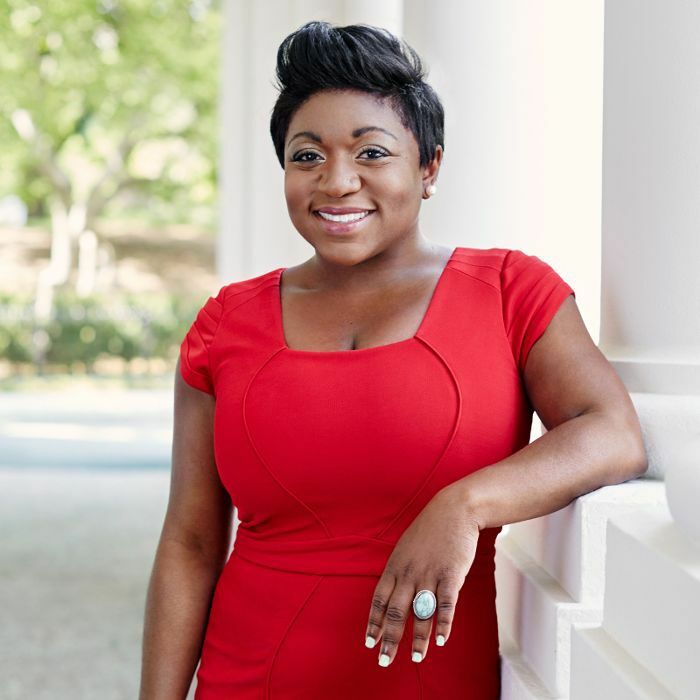 Accepting an internship might seem like a natural move for those fresh out of college, but when Deesha Dyer applied to become a White House intern in 2009, it was hardly conventional—she was 31. Hailing from West Philadelphia, Dyer's résumé is pretty unexpected for a White House staffer: After dropping out of college, she worked in real estate and later as a hip-hop reporter. But when Barack Obama became the 44th president of the United States, she felt a magnetic pull to politics. "When President Obama and Mrs. Obama came on the scene, I felt for the first time like I was included. There was a place for me," she says. "Partly because they were black, but also because they were just ordinary people doing extraordinary things. They said a lot of the things I had thought for a while but was too scared to voice." Little did she know, applying for that internship would set her on a new career trajectory—one that saw her promoted to Obama's social secretary and later to found a nonprofit, BeGirl.World. Elle goes as far as to call her one of the few people who "could tell the president of the United States what to do." We tapped the unstoppable force that is Deesha Dyer to find out how she went from intern to White House staffer to entrepreneur—and why she's just getting started. When talking to Dyer, it doesn't take long to understand why the Obamas liked her so much. Every response she gives is thoughtful and eloquent, delivered with such energy that you can't help but want to support her. Perhaps it's this positivity that led to promotion after promotion. "I had three positions before I got to social secretary—I just kept getting promoted to different roles," she says without a hint of ego. When asked how she managed to climb each rung so quickly, Dyer pauses before responding. "Two things: I think a lot of it was my desire to try new things but also because I always sought out [roles] based on my interests," she says. In each position, she'd question what aspects she excelled at, and then tried to pivot based on her skill set. "I tried to think about things that I naturally loved doing: I love traveling, interacting with different communities, and entertaining." If there was a formula for career success, we think Dyer might have found it. "In the end, my hard work and natural inclination to do those things was the winning factor," she says. While the steady stream of promotions should have acted as reassurance, Dyer admits that she struggled with self-doubt. "I was scared that someone would be like, 'Just kidding, you don't really have this job,'" she says. "I just didn't want to mess it up." To combat her nerves and fear of failure, she called on the expertise of others in her team and tried to put on a brave front. "I was very insecure, but I knew that if I exuded insecurity, I would fail, so I did the best I could to tap into confidence. I just thought, Get through this one event, do it immaculately, kill it, and then onto the next one, and it worked." A trip to China with the former president was an eye-opening experience. "When I was in Beijing, I saw a school group visit the embassy and there were no black kids. It made me realize that black kids need to know about foreign service offices and careers in travel," she says. A regular at foreign embassies, she says this lack of diversity extended beyond school groups, too. "[U.S. embassy staff] around the world are not very diverse, either. They were all white and majority male. There were really no women of color." Never one to coast, Dyer felt charged to make a difference on a micro level and started BeGirl.World as a side hustle, a nonprofit that encourages young girls to learn from other cultures. "It came from a desire to teach women of color about foreign service and studying abroad," she explains. "They look at studying abroad as an option for white people, and say, 'I'm not going to apply because I don't fit.' But the number one thing I want young girls to know is that they are worthy. They belong in this world and the world deserves to see them." While Dyer used Black History Month as an opportunity to talk to the girls in the program about the first black female pilot and airline discrimination, she urges that we shouldn't stop the conversation when March ends. "Black history is American history. Don't make it one month. Instead, let's look at what's happening around us right now—we are creating history," she says. Dyer hopes that by talking openly to young girls, no matter their race, we can encourage them to speak up and get involved. "We've got to talk to children and each other and look at what's going on in the world. Ask, what can I do to be part of the change, from the position of an ally, not as an elite?" she says. It's hard not to feel emboldened after speaking to Dyer. She's someone who has broken the linear career mold, pivoting from hip-hop reporter and intern to White House staffer and nonprofit founder—if anyone proves it's possible to have more than one calling, it's her. That's a message she hopes to convey to the young girls in her organization. When asked what advice we need to tell girls more often, she says, "Don't limit yourself to one career track. You've got to allow yourself the space to change and be kind to yourself along the way." No matter your job title, age, or race, that's a powerful piece of advice we could all do well to remember.